WALTHAM, Mass. — A quirky art exhibition called Steampunk, Form & Function recently opened at the Charles River Museum of Industry & Innovation here. But, you might be wondering, what the heck is Steampunk? “Steampunk is actually pretty hard to define,” said Bruce Rosenbaum, a major Steampunk fan and owner of Steampuffin, a design company. He's sponsoring the new show and met me at the museum. Steampunk’s been percolating as an aesthetic movement since the 1980s — with goths and the sci-fi community, for instance — but it’s still pretty fringe. If you don’t know what it is, you’re definitely not alone. To get your gears turning, though, you could think of Jules Verne and the Nautilus in “20,000 Leagues Under the Sea.” Or H.G. Wells’ “Time Machine.” Even Willy Wonka could inspire Steampunk. It’s brass, corsets, cogs, aviator goggles, monocles, bubbling liquids, pocket watches, pipe organs, gauges and valves — fused with iPods, thumb-drives and today’s high-tech gadgetry. An iconic Steampunk image is a modern computer keyboard that has old-school typewriter keys — and it works! This gallery is filled with artist-made contraptions that could’ve been invented in an imaginary retro-future. They're elegant, but clunky-looking at the same time — not streamlined the way our gadgets are today. But still, these anachronistic pieces are highly-crafted, intricate, engineered and utilitarian. They ooze D-I-Y. Museum director and curator Elln Hagney cranked away on the Steampunk cotton spinning wheel generator. It's an exercycle (probably from the '70s or '80s) connected with an antique spinning wheel. Pedaling powers up a small generator that lights up a lantern. Then she showed me the Steampunk telegraph guitar. Then she drops a few coins into the Steampunk pinball machine. Play it and you can create life itself! “You hear the buzz of electricity, the drip of amino acids,” she said with a wink as she whacked the metal ball up and into the bumpers. This, and most of the other objects, are tongue-in-cheek, fantastical, weird and a lot of fun. More seriously, though, Hegney is psyched about the Steampunk exhibition because it’s attracting a different, more alternative crowd to a museum that’s dedicated to Industrial-era history and machinery. Todd Douglas Cahill feels the same way. 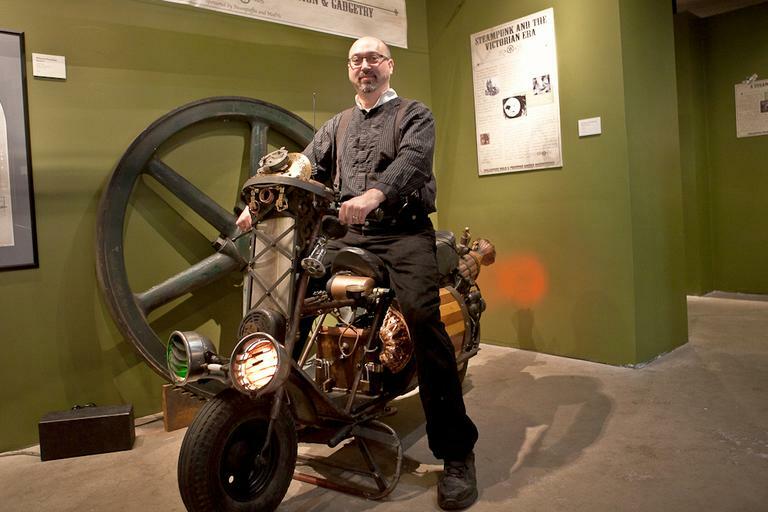 One of his steam-powered kinetic sculptures is in the show, but he doesn’t see himself as a "Steampunk.” Cahill’s an actual steam artist who's been reviving antique steam machine models for 20 years, and his workshop is in the same old former watch factory as the museum. It’s filled with old tools and machinery he uses to make his art. One piece puffs away while we chat. He tweaks the flow of steam so the model doesn’t sputter and spurt. Cahill hangs out with serious steam machine fanatics — most of them much older than he is. He says it’s been interesting for him to watch the rise of Steampunk from the sidelines. It’s good, he says, because the cultural movement is keeping our industrial past alive — and making it hip. “A lot of that generation that lived with this stuff is now very much gone,” Cahill said. 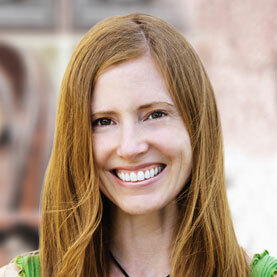 Cahill has his own ideas about why we modern people connect with the older technologies on a visceral, even emotional level. At the same time, though, maybe it doesn’t matter what the Steampunk telegraph guitar actually tells us about ourselves because — frankly — it’s just really cool. I bet Captain Nemo would agree. There’s a Steampunk Meet-Up at the Charles River Museum of Industry & Innovation on Sunday, Dec. 19. This program aired on December 17, 2010.